In 1569 Sir Thomas MacLellan received a Crown charter to the lands of the former convent of Greyfriars, established in 1449 by James II. The Charter granted him the stone of the buildings, much of which was used to build MacLellan’s Castle. The church was sold for use as the town Parish Church, the south aisle retained as a family vault. This became known as the MacLellan Aisle which forms the chancel of today’s church. Sir Thomas and Grissel are portrayed in stone over the arch recess. By 1728 the church had fallen into disrepair and a petition was granted to demolish the building. In 1730 The MacLellan Aisle was incorporated into a new larger church featuring six high arched windows and a magistrate’s gallery. By 1839 the present Parish Church had been built, and Greyfriars razed leaving the MacLellan Aisle intact. It was rebuilt as a school owned by James Earl of Selkirk. Known as the The Castle or Old Church School, it had two rooms in which the children were taught. 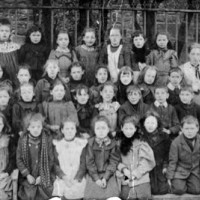 It remained a school until 1915.